Eine malerische, typisch California Strandhaus, von dem bekannten Cambria Aquarellkünstler und Grafiker, Jo Werts gebaut. Entwickelt, um maximalen Nutzen aus Licht zu nehmen, ist es vollgestopft mit großen Fenstern mit Meerblick, und hohe, offene Deckenbalken, so dass es eine helle und luftige Gefühl. Es ist einfach, aber komfortabel mit einem King-Size-Bett ausgestattet. Es ist mit einigen der Frau eingerichtet Werts Werke und eine Reihe von anderen Originalabzüge. Das Haus liegt auf einem Hügel mit Blick Cambria Marine Terrace, und bietet einen spektakulären Blick auf das Meer von fast jedem Raum im Haus. Es ist ein Deck aus dem Schlafzimmer mit schönen, Ansichten Wildwasser-Meer, sowie eine private, geschützte Terrasse und Garten im Hinterhof-Bereich. A 2-3 Minuten zu Fuß zu den Ozean Bluff Wanderwege des Ost-West-Ranch Openspace, der Harvey St. Beach, Lampton State Park und Wedgewood Tidepools. Vollbad ist eine verglaste Badewanne / Dusche-Kombination auf der oberen Ebene von der Schlafbereich. 2. Bad ist ein 1/2 Bad-WC auf Einstiegslevel. Das Haus ist nur einen kurzen Spaziergang zum Meer und Gezeiten-Pools und dem Fiscalini Ranch Preserve, die ein beliebter Ort für Morgen oder späten Nachmittag geht es. This high-ceilinged, light-filled space is the perfect location for a quiet, creative vacationer who enjoys gorgeous views, walks by the ocean, or simply relaxing on the deck as the sun sets. We highly recommend a stay at the house, very well managed (Debbie) and appointed, with everything you need to cook indoors or out, watch a movie upstairs or down, take a nap. 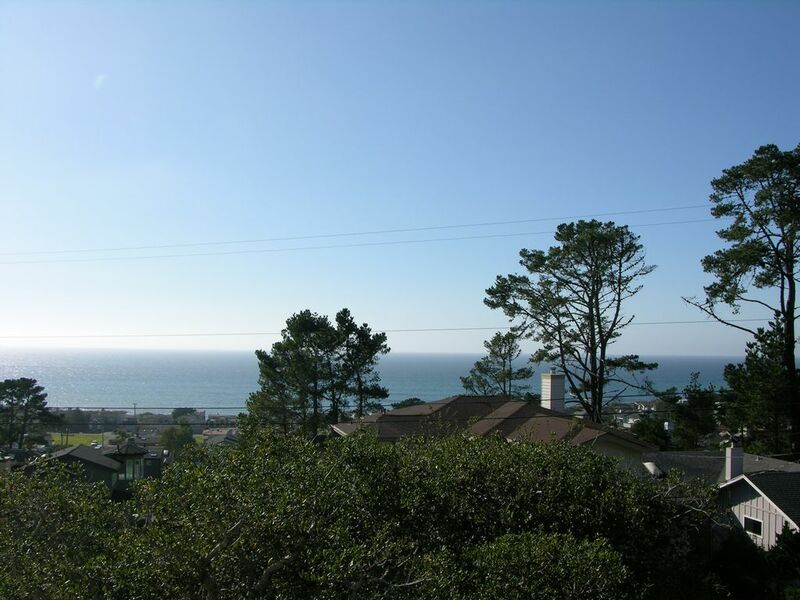 Views of the ocean, just blocks away, are unparalleled, and Fiscalini Ranch, a public open space, is nearby with many trails, the main ones very accessible. While the interior as a circular staircase, the second floor is also reached by an ordinary stair, making unpacking a breeze. Each year we've tried to do less and less, because we like staying at the house! Clos Solene, Hearst, and other wineries beckon; this year, flowers towards Carrizo Plain were spectacular; our favorite seafood restaurant in Morro Bay was and is consistently fantastic; San Luis Obispo has anything you've forgotten, plus an independent movie theater, terrific sports stores, and so on. Cambria itself has the feeling of an historically creative town, and the neighborhood the house is in reflects the value of enjoying beauty along with activity. Extremely clean and well stocked. Perfect place for a short weekend and the view from the upstairs was wonderful. Great place for me to get caught up on work - and relax. This isn't a place for young children, but for a couple or a single person just looking to relax, it is perfect. Loved the view!!! Super clean and very nicely decorated. The kitchen appliances need to be updated. But it is truly charming. We'll be back...in a heartbeat. Great views of ocean from multiple areas of the lofted structure..the wife loved waking up in bed to see the ocean every morning. A really stunning place to stay. My wife and I really enjoyed our three-day stay in this lovely cottage. Well-appointed, terrific views, so much sunlight, and frequent visits from the local deer. We'll be back! A cozy cottage and just the right size for two people. The views and sounds of the ocean from the upstairs bedroom are amazing and the room is large enough to comfortably relax there with your coffee or a snack and a favourite book! Debbie was very kind and helpful with any problem so we had nothing to worry about during our stay. This cottage is very clean,which is always important to me and also well stocked with everything you need. My husband and I enjoyed our stay there celebrating our 25th anniversary and regret we couldn't stay longer! This property is close to lots of things to do even though the town was quiet and peaceful with deer wandering the streets. We enjoyed whale watching in Morro Bay, riding the sand dunes at Pismo beach, driving along the coastal trail, and beautiful walks at Fiscalini Ranch Preserve within easy walking distance from the cottage! We will be back if we ever get the chance!